Cincinnati indie rock rockers The National are a five-man band consisting of two sets of brothers and lead singer Matt Berninger rounding out the fifth man. His relationship with his non-musical brother Tom (the co-subject and director of the film), who he invites on to tour to be a roadie, is the basis of the film as it delves into issues of self-loathing and sibling rivalry. Tom Berninger, nine years younger and still living at home, documents Mistaken for Strangers as an atypical rock documentary based on thoughtful relationship dynamics. Matt's casual and effortless ease as the frontman of one of the most popular contemporary rock bands is contrasted sublimely with Tom's affable aimlessness and penchant for acting out. Early on, Matt relents Tom's indifference to his band's genre of music, remarking his preference for heavy metal despite his clear admiration for his more disciplined older brother. The National, portrayed as indie rock darlings penetrating the mainstream, come off as professional musical craftsmen lacking any real drama or angst. This is where Tom's amusing antics as an inept roadie come to play as he comments on the band members, angling to reveal their own non-existent issues while coming to grips with his own delusions, using his brother's success to justify his own self-worth. Tom's sit-down interviews with the band, posing strangely off base, open-ended questions come off as amateurish yet genuinely charming in their awkward deadpan delivery. It's really fascinating how Tom interacts with members of the band and their crew on their 2010 High Violet tour. As Tom finally wears out his welcome, the film transforms into a meta running commentary about the making of the documentary we're watching (and Tom's self-destructive efforts and struggles to complete it) as well as an exploration of success, failure, and the creative process. Director Tom and his brother Matt capture an authentic portrait of brothers inside and outside the band. Tom's intimate concert footage mixed with his talking straight-to-camera segments, rambling interviews, and general mischief make for a uniquely compelling film only loosely exploring the nature of rock 'n roll. 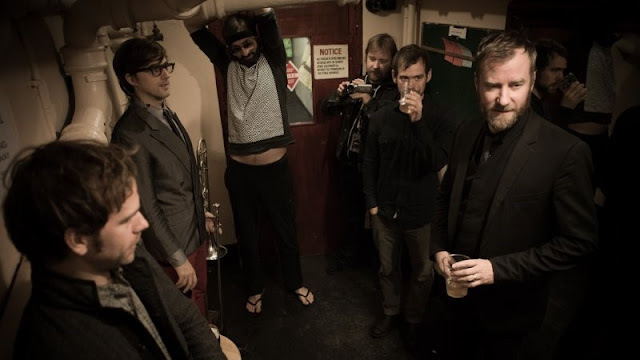 The Berninger brothers wisely use The National as a band, their tour, and career as an entry point to reveal their own feelings about their respective talents and ambitions. It's biggest plus is how it shows its subjects unpolished in genuine situations, revealing their real feelings in every moment.